If a single tree is planted alone on a hill, then it is left to battle the elements alone. If a tree is planted alongside other forestry, those surroundings will protect it; allowing all to flourish. Such is the life of our native forests. The same is true of keiki. 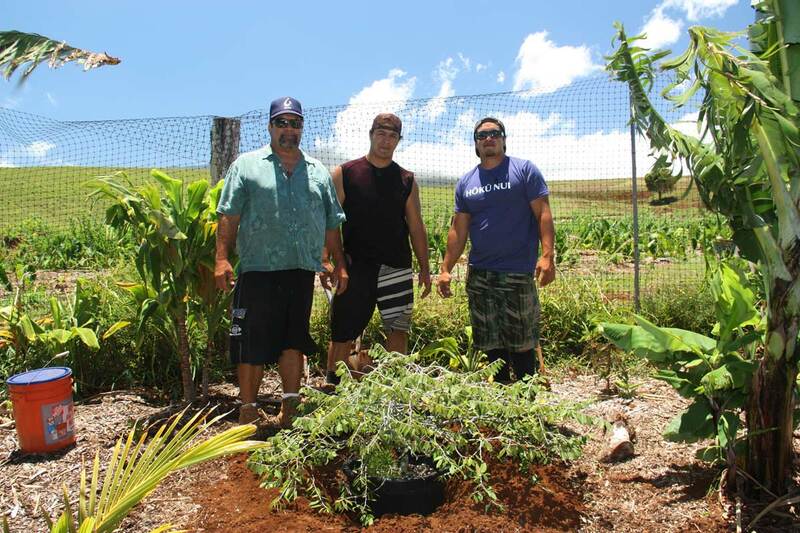 A child surrounded and protected by mākua, kūpuna and ʻohana is healthier. The name Makawao means “forest beginning” and is known as a transitional climate zone between the dryer elevation below and wetter regions above. This area was described as having been heavily forested with Mesic forest species such as ‘Iiiahi (sandalwood), koa, ohi’a and halapepe. Endemic and Polynesian-introduced plants growing in this area were wiliwili, pepeiao, ‘ape, neneleau (Hawaiian Sumac), kolea, kukui, kalo, uala and palapalai (fern). 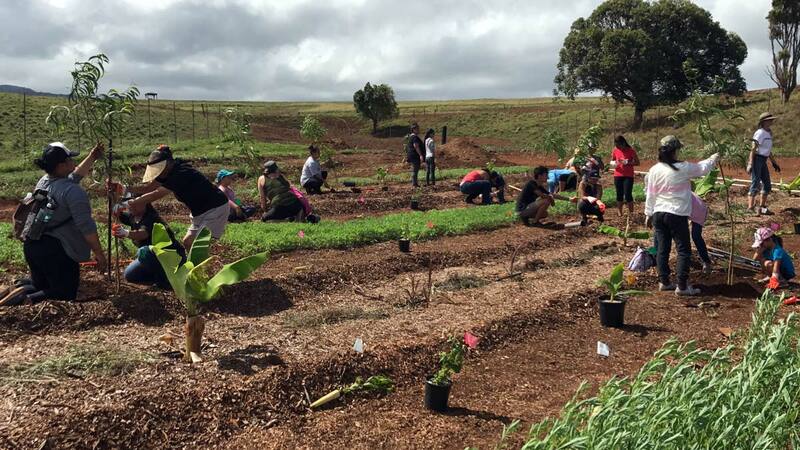 Working with ‘ohana and the Hawaiian community, Hōkūnui Maui and Hōkūnui Farms is committed to bringing native plants and traditional crops back to the land. We aim to create an accessible forest resource for cultural practitioners, contribute to a healthy watershed, provide food for our community and create native habitat for birds, bats, insects and other native fauna. 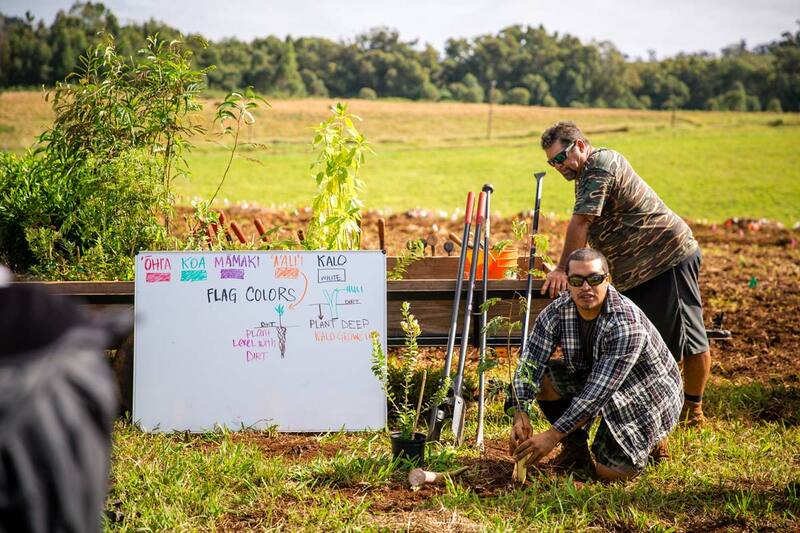 Guided by a ten-year Forestry Stewardship Management Plan, Hōkūnui Farms is planting 20-acres of native trees on land that was used for plantation agriculture for 100 years. 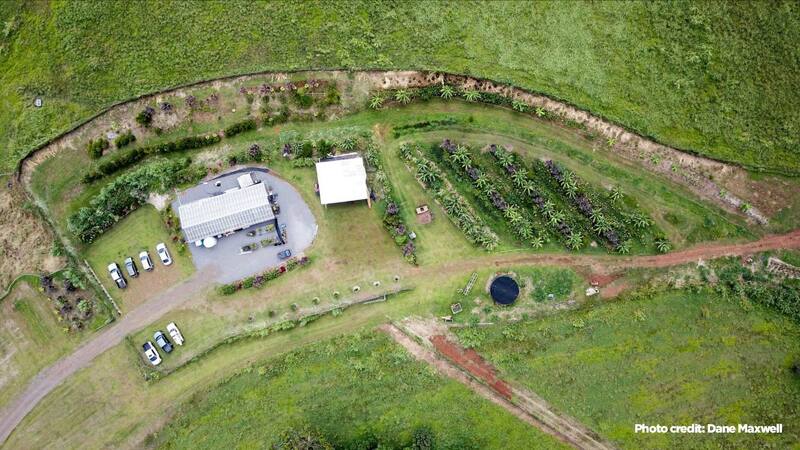 Poly-Forestry (Polynesian Agroforestry) is a unique method of reforestation developed by the ʻOhana Hewahewa, which fuses Hawaiian indigenous farming techniques and knowledge with modern day tools and technologies. This method is bio-diverse with dense planting done in a successional way. 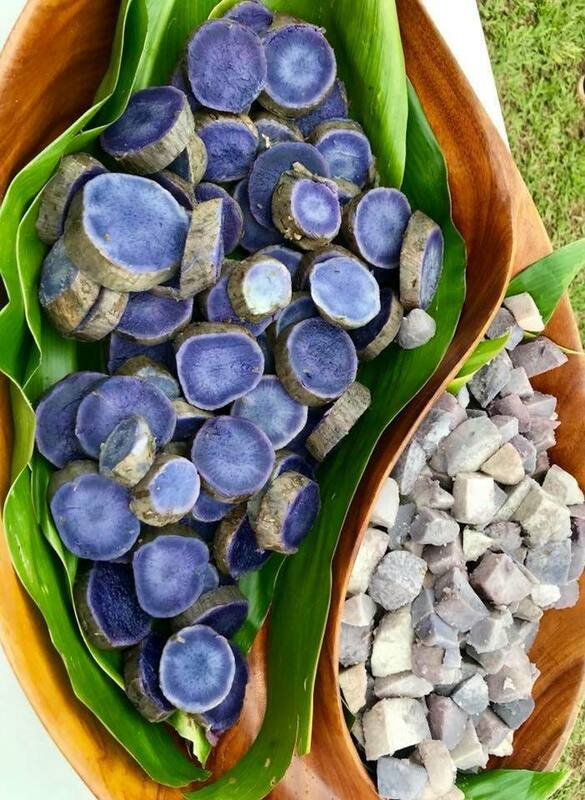 It incorporates Native Hawaiian canoe crops, like kalo (taro) maiʻa (banana), Kō (sugarcane) etc., with our Native Hawaiian forest trees such as Koa (Acacia koa) and ʻOhiʻa (Metrosideros polymorpha). 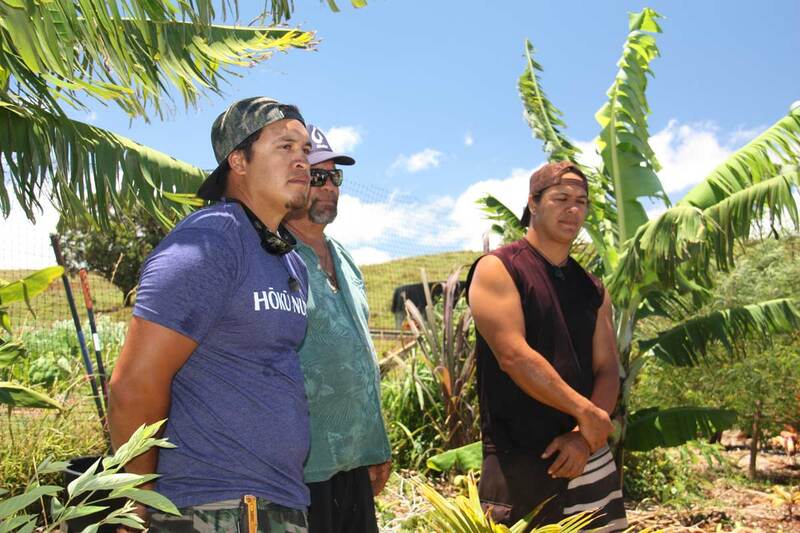 Together these plants create a ʻOhana Style effect, which is the mindset and value system of ʻOhana Hewahewa when farming and managing lands, staff and operation. The important idea of family style planting is having family together, to take on the challenges and successes of life. When plants, animals and humans alike are in their younger stages of growth, they are very susceptible and vulnerable to pests and predators. Planting in a successional method, such as planting the fast-growing hardier plants simultaneously with the slower, fragile plants, allows the hardier plants to provide quick protection from wind and pest. • Kaulana Mahina: Understanding the Hawaiian Moon calendar and how it affects flora and fauna. The moon dictates the moving of all liquid including the water in the biology of the plants and animals. This knowledge allows us to schedule our work days, weeks and year to the benefit of the plants, depending on the phase of the moon. • Dense planting: Planting plants very close together. Benefits of this planting style includes windbreak, shade to shade out weed growth, and pest control. It also helps some of our trees to self-prune, dropping its organic matter or leafy material in place to mulch our trees. • Bio-Diversity: Planting many different varieties of plants. 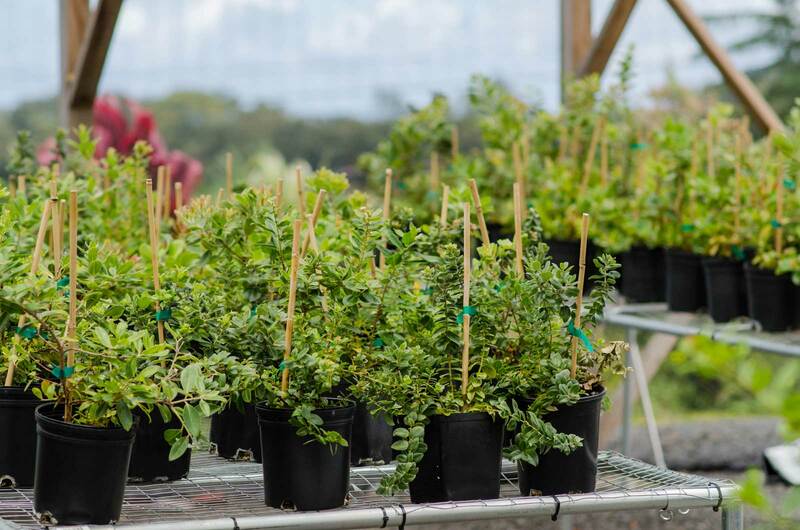 • Pest Trapping: Planting many different varieties of plants together to create a diversion for the pests to confuse and distract them from attacking our vulnerable native trees. • Mulching: The use of leaves, grass and wood chips to suppress weed growth and protect the soil from evaporation. Mulch can hold moisture and self-distribute water when necessary. 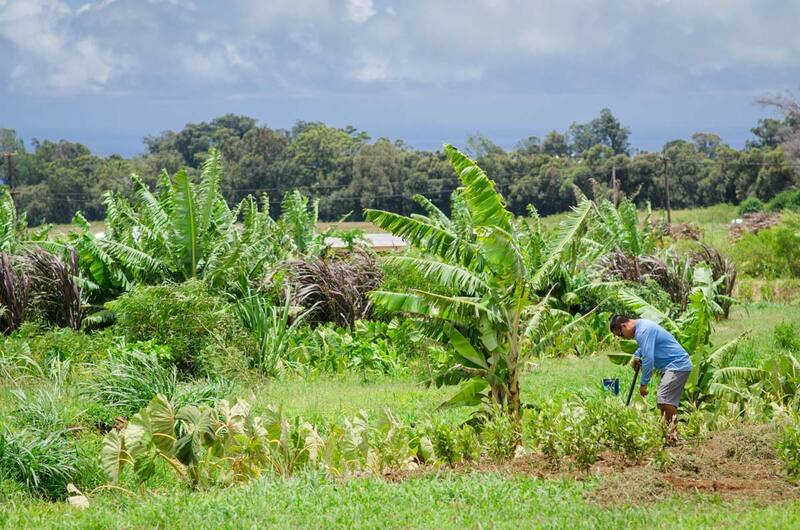 The Hōkūnui Farms forestry project is supported by the Hawai‘i’s Forest Stewardship Program (FSP), administered by the Department of Land and Natural Resources, Division of Forestry and Wildlife (DLNR-DOFAW) and the Natural Resources Conservation Service (NRCS). (E) Endemic: Plants found only here in Hawaiʻi. (I) Indigenous: Plants found here in Hawaiʻi, but also in other places around the world. Native Hawaiian trees function as protectors of the smaller trees and shrubs and play an important role in our unique native Hawaiian watersheds. These trees provide canopy to capture rainfall and fog to distribute moisture evenly outward, down through the root system and into our aquifers to provide us with drinking water. 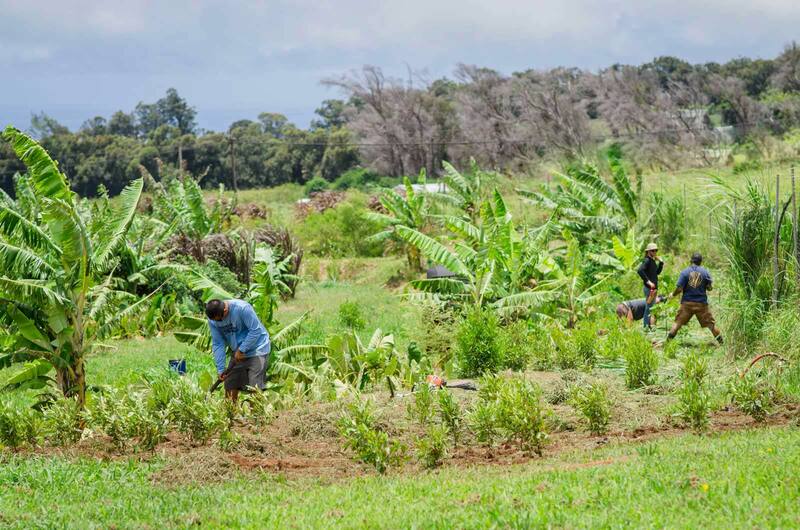 They create an entire self-sustaining eco-system within that biota which provides rich nutrient soils and precious habitat for our native birds, insects and other native flora and fauna. • (E) Koa (Acacia Koa): One of the most valuable wood sources in ancient times; canoes and many hand tools were carved using its beautiful wood. 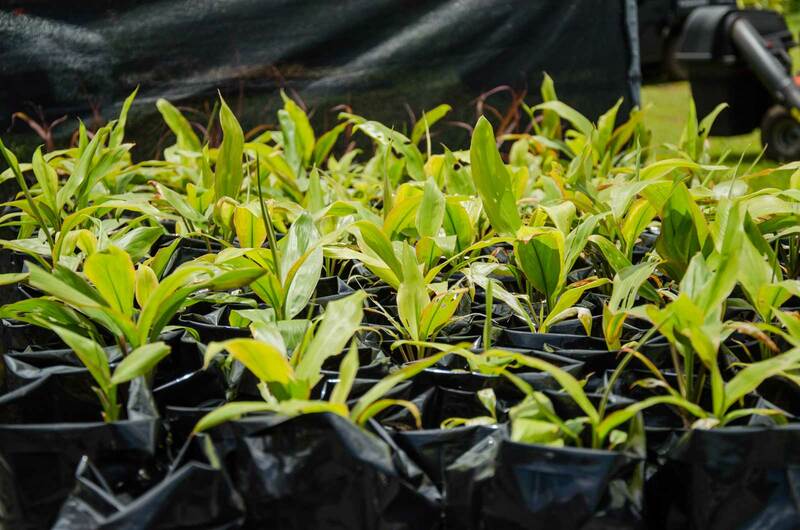 Koa has the ability to fix nitrogen and fertilize the forest. Itss sickled leaves drip water down and around, which also acts as irrigation for the forest. • (E) ʻOhiʻa (Metrosideros polymorpha): Known as a pioneer specie, for it is usually the first tree to grow on lava. Its strong taproot can break through blue rock and distribute water to our aquifer. ʻOhiʻa can be found in many forms, from a sprawling shrub to the tallest tree in the forest, hence the species “polymorpha” meaning many forms. It was also a very valuable hardwood with many uses. These plants include ground covers such as ferns and mosses. The understory, or groundcovers, play an important role in protecting the soil and acting as living mulch that holds and distributes water in wet or dry times. They also provide a vast eco-system for our microorganisms and micro-flora and fauna. 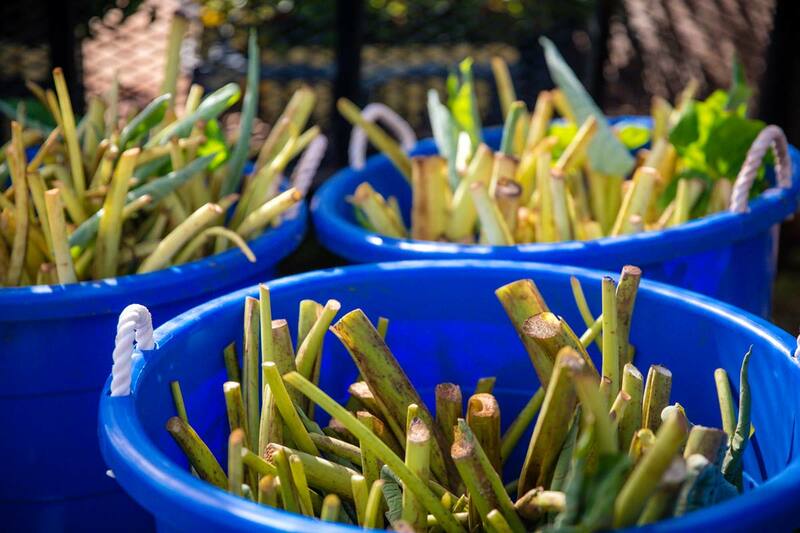 Plant life at Hōkūnui Farms begins at Kapūʻao (the womb) Plant Nursery, which nurtures about 30 different native and canoe plant species before they are planted in the ground. Hōkūnui also works with native plant experts in our community to source plant material and learn from their expertise. Hōkūnui is in the moku of Hāmākuapoko, one of 12 land divisions on the island of Maui. 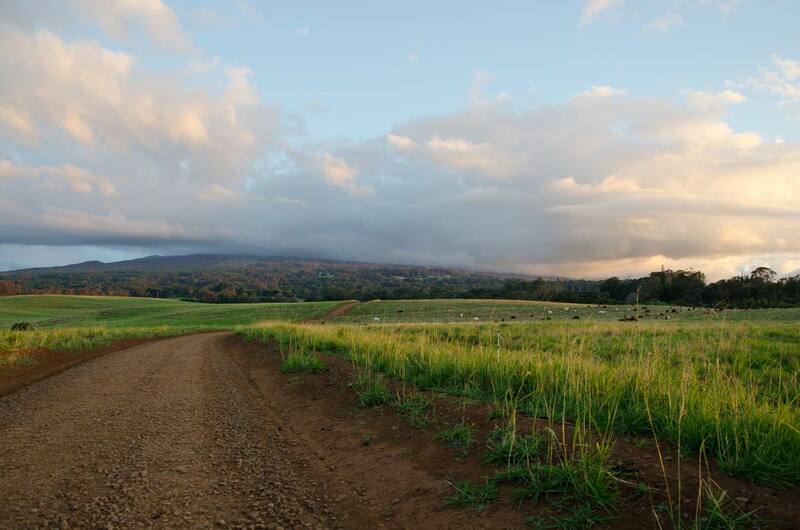 Within the moku is the ahupuaʻa of Makawao, of which Piʻiholo is the region where our project is located. 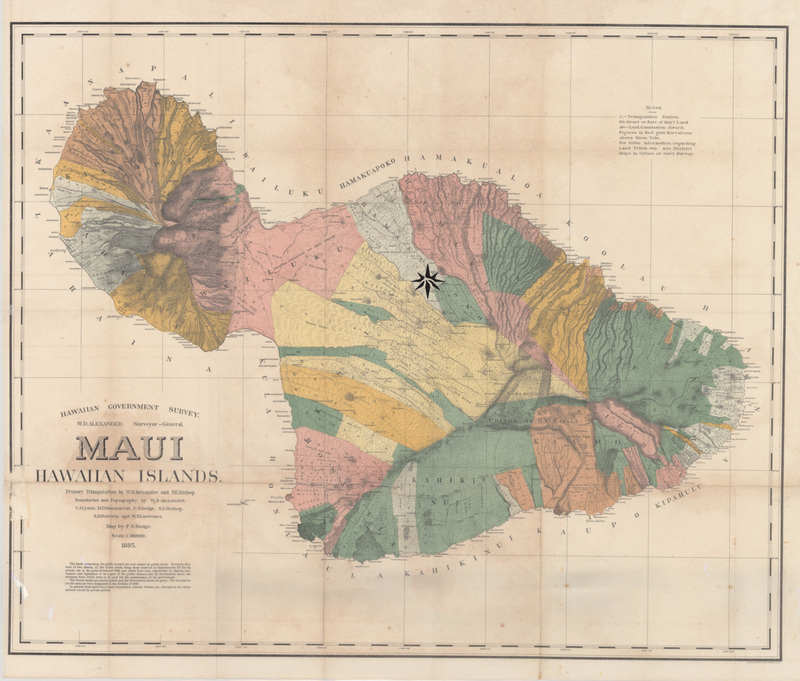 This area was renowned in ancient times as a place where royalty would visit the ponds of Kalena to swim and relax in the cooler upland temperatures and where the forest thrived with ʻAwapuhi, Palapalai, Koa, Kukui, ʻAʻaliʻi, Lehua. I ka malu kukui o Kapela lā.